"Silly Fun Celebrates Marriage, Family and Love"
In HOTEL TRANSYLVANIA 3: SUMMER VACATION, Dracula’s daughter takes the family and their monster friends on a cruise ship, where Dracula falls for the ship’s beautiful captain, but the captain turns out to be a descendant of Van Helsing, the famous monster hunter. HOTEL TRANSYLVANIA 3 features lots of silly fun and has a delightful ending that promotes family, marriage, and turning enemies into friends, but caution is advised for very young viewers. 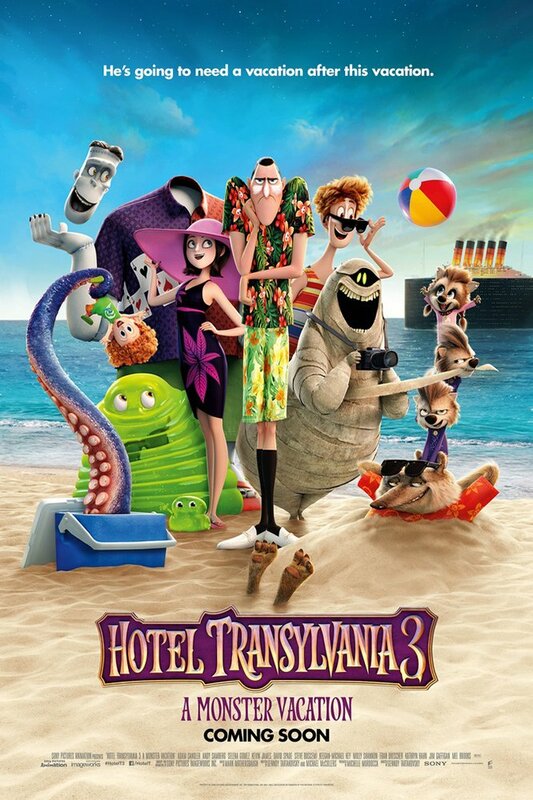 In HOTEL TRANSYLVANIA 3: SUMMER VACATION, Dracula’s daughter takes the family and their monster friends on a cruise ship to the Bermuda Triangle and Atlantis, where Dracula falls for the ship’s beautiful captain, but the captain turns out to be a descendant of Van Helsing, the famous monster hunter. HOTEL TRANSYLVANIA 3 features lots of silly fun and has a delightful ending that promotes family, marriage and turning enemies into friends, but caution is advised for young viewers. The movie begins with a prologue showing various past attempts by Count Dracula’s arch-nemesis, Abraham Van Helsing, to destroy all monsters. Eventually, Dracula defeats Van Helsing by dropping him into the ocean. Cut to present day. Drac is cranky and getting out of sorts. Mavis, his daughter, decides her father needs a vacation with his family, including her son, Dennis, and her husband, Johnny. Naturally, all their monster friends have to come along. So, Mavis charters an airplane operated by gremlins. After a wild ride and crash landing near the Bermuda Triangle, they board a ginormous cruise ship run by a beautiful blonde captain named Ericka. The minute Dracula sees Ericka, it’s love at first sight. Little does he know, however, that Ericka is actually a descendant of Abraham Van Helsing. In fact, her great grandfather has kept himself alive by eating kale and replacing most of his body parts with machine parts. When they get to the Lost City of Atlantis, the Van Helsings want to retrieve the device that destroyed Atlantis, so they can destroy all the monsters. How can they be stopped? HOTEL TRANSYLVANIA 3: SUMMER VACATION is a bundle of silly fun. The trip on Gremlin Airlines is hilarious. There are also some funny bits involving creatures under the sea when everyone goes scuba diving, involving Wayne the werewolf and his wife Wanda, and involving Dracula’s grandson and his young friend who sneak their big dog, Tinkles, onto the cruise ship. In one scene, Dracula and Ericka do a really funny dance trying to evade all the booby traps around the secret device, which Ericka fools Dracula into thinking is just a harmless family heirloom. The animation in SUMMER VACATION is quite spectacular and colorful. The trip on Gremlin Airlines, the underwater adventure, and the visit to the Lost City of Atlantis were among the most beautifully crafted sequences. The HOTEL TRANSYLVANIA team clearly outdid themselves this time. Finally, everything culminates in a delightful third act. The climax to the story is filled with hilarity, excitement, jeopardy, toe-tapping music, and heartfelt moments. The ending not only affirms marriage and family. It also resolves everything in a positive, redemptive way. Love conquers all and transforms even the most hardened heart for the better. Ultimately, HOTEL TRANSYLVANIA 3: SUMMER VACATION makes for a fairly family-friendly outing. Caution is advised mostly due to some cartoon violence, jeopardy, the little gremlin monsters, a big monster at the end, a couple jokes about passing gas, some references to the power of positive thinking, and a couple references to gambling. Atlantis is made to look like a gigantic Vegas, with lots of neon lights and two or three shots of some gambling tables. Also, there’s a magical scroll, but the scroll is clearly evil. Villains lie, children dress up their giant dog to look like a human and sneak on board a cruise ship, and some references to gambling (the Lost City of Atlantis is designed to resemble Las Vegas, there’s a shot of some characters around a roulette wheel, and a brief scene shows Frankenstein playing a card game despite a warning from his wife, but the wife’s warning about gambling is validated). HOTEL TRANSYLVANIA 3: SUMMER VACATION is another animated adventure featuring Count Dracula. Mavis, Dracula’s daughter, thinks her cranky father needs a vacation. So, she books an airplane operated by some crazy gremlins to fly the family and their monster friends to a giant cruise ship at the Bermuda Triangle. The cruise ship is run by a beautiful blonde captain named Ericka. The minute Dracula sees Ericka, it’s love at first sight. Little does he know that Ericka is actually a descendant of Abraham Van Helsing, his arch enemy, and means harm to him and the monsters. HOTEL TRANSYLVANIA 3: SUMMER VACATION is a bundle of silly fun, with several hilarious moments. The animation is spectacular and colorful. Also, everything culminates in a delightful third act. The story’s climax is filled with humor, excitement, jeopardy, toe-tapping music, and heartfelt moments. The ending not only affirms family and marriage. It also resolves everything in a positive, redemptive way. Love conquers all and redeems even the most hardened heart. HOTEL TRANSYLVANIA 3: SUMMER VACATION is a family-friendly outing, but caution is advised for younger children.